1957 Dodge Coronet D-501 (top image by Jim Donnelly); 1957 Ford Custom E-Code (bottom image by the author). That or That is not a comparison report between two vehicles, but rather a feature that enables us, in an idyllic world, to add a collectible vehicle into our dream garage on a regular basis, but with a catch: We can only pick one vehicle from this pairing and it has to be for enjoyment purposes rather than as an investment. 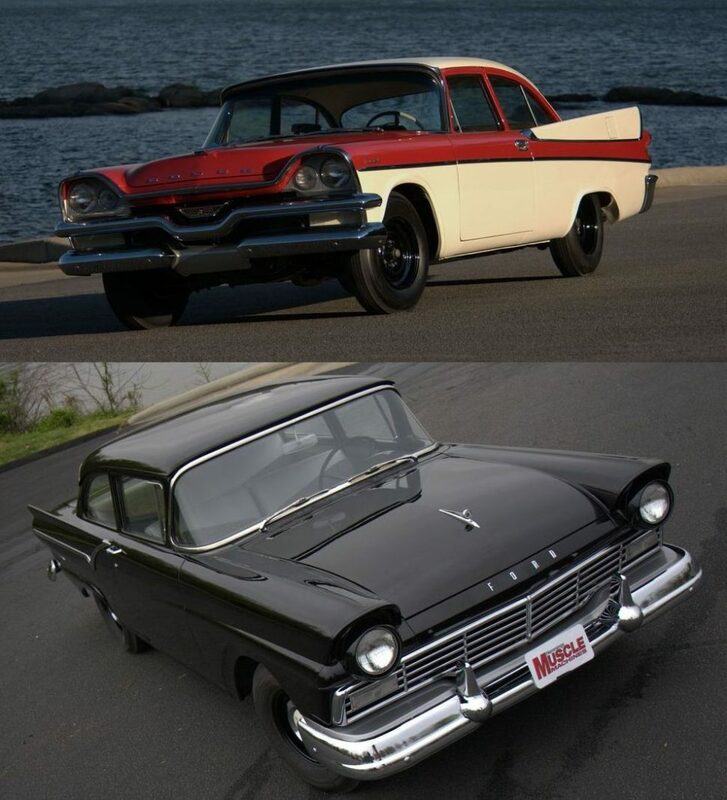 Featured in this edition of This or That is a choice of two cars from the first serious salvo of the postwar performance era: a 1957 Dodge Coronet D-501 or a 1957 Ford Custom E-Code? The significance here is not so much in the primary model name, but rather in the nomenclature that follows. Both the D-501 and the E-Code engines were short-lived variants developed by their respective corporate engineers and employed by race teams well-versed in various on-track disciplines. In short, they were homologation specials; a term more closely associated with the aero wars that were unleashed a decade in the future. Let’s take a closer, albeit brief, look at each (if you’d like to read more than we provide here, both were featured in our Hemmings Muscle Machines magazine; just click on the provided links above). To set the stage for these two early supercar warriors, recall that the “win on Sunday, sell on Monday” catch phrase was resonating throughout Detroit. Whether factory-backed teams were racing in a straight line, or turning left on the nations bullrings, their prowess–and wins–on any given weekend generated showroom sales; and in a greater sense, very nearly a “win at any cost” attitude. This, of course, meant a horsepower war unlike any previous, so intense that by the time the 1957 NASCAR season began to unfolded, the sanctioning body was in a short-lived, pre-AMA-ban window of legality for superchargers, fuel injection, and multiple carburetion. It was into this window of opportunity in which the D-501 came into being. A racer since his teens, Don can recite D-501 history since it was new and coming into competition for the first time. When he starts discussing it, his first topic is debunking the old-line supposition that 100 of the D-501s were built. Not so. The aforementioned Chrysler 354 touted an 11.0:1 compression ratio and employed a flat-tappet camshaft, along with dual 500-cfm Carter WCFB carburetors. By all accounts, it wasn’t hard for racers, then and now, to tune-up the Hemi, boosting output (in some instances) to a barely manageable 400-plus horsepower (at the flywheel). Prior to the 1957 NASCAR season, Ford had been left in Chrysler’s letter-car dust for two years running. During that brief span of dominance, Chrysler racked up 49 wins in 101 events. Add to that the 12 wins by Dodge, and it makes Ford’s 16 victories in two years (14 of which were scored late in the 1956 season) seem like a pebble in a vast Mopar sea. Incidentally, Chevy had a pitiful total of five wins. In its final appearance in a Ford, the Y-block 312 saw significant upgrades. Engineers opted to retain the 3.80-inch bore and 3.44-inch stroke throughout the 312 line. However, the old 215 hp P-code received a bump in compression, which in turn increased horsepower to 245–this became the new base 312 offering, listed as D-code. Meanwhile, the previous, and rarely seen, dual-quad-topped version was designated the E-code; it’s this engine that resides under the hood of Don’s Tudor. A slight increase in compression meant that the engine could now produce 270 hp and 336 lb-ft of torque. Of course, the real kick in the pants was the new F-code option. Simply put, it was a 312 that engineers fitted with a McCulloch/Paxton centrifugal supercharger that juiced the engine to the point where it produced a then-thunderous 300 hp in street form. Aside from the actual supercharger, most of the increase in power in the F-code 312 came from the use of a new camshaft that increased both the lift and duration. Also factoring in were redesigned cylinder heads; according to Don, Ford actually redesigned the heads several times over the course of the ’57 run. But what few realize is that there were also race versions of the E- and F-code engines. The former could produce 285 hp, while the latter pumped out a staggering 340 horses. On the track, the E- and F-code combo (particularly the latter) catapulted Ford to the top of the year-end win column in 1957 with 26; Chevy, with its fuelies (the Black Widows), was a close second with 21 victories. were produced in only two big runs, which ended because the manufacturers pulled out of racing at the end of ’57. Most of the assembled blocks were sent to race teams, or to the Ford dealers, as they were an over-the-counter item. Putting a production figure on the street version is very difficult, but the best number that anybody has been able to come up with is approximately 600–and that was in all Fords, including the Thunderbird. Complicating things slightly for the 285-hp version of the E-code is the fact that when the F-code was introduced, Ford killed the amped-up E-code. Given their race-bred DNA, power, and rarity, which of the two would you add to your stable and why?